A contract to set up a solar district heating network in Langkazi county in Tibet has been awarded to Arcon-Sunmark Large-Scale Solar Systems. 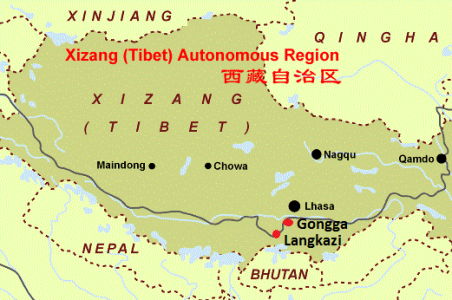 The Chinese-Danish joint venture signed an agreement with the local government of the autonomous region of Tibet. The system should provide solar district heating for 82 600 m² of floor area and meet 90 % of the yearly space heating demand in Langkazi, the town sharing its name with the county. The system, planned to be set up by November, will consist of a 22 000 m² collector field, 15 000 m³ of pit storage and a 3-MW electric boiler. The sponsor of the pilot project is China’s central government. ‘Tibet has double the radiation found at most central European cities and enjoys similar levels of sunshine each month,’ Jiao Qingtai, Vice President of the Sunrain Group, said of the region’s solar potential during a presentation at the Task 55 meeting in Abu Dhabi, UAE, in November 2017. With average temperatures of below zero in northern and around 8 °C in southern Tibet, there is large demand for heating all year round. Langkazi county, which is surrounded by tall mountains on all four sides, is in the southeastern part of Tibet, an average 4 500 metres above sea level. Up here, the boiling point of water is as little as 85 °C, a great challenge for anyone designing district heating systems. Qingtai said that the town’s advantage was a lack of heating equipment in its building stock. It meant that new space heating units could be adapted to accept a fairly low supply temperature, 70 °C to be exact. Hydraulic adjustment inside the buildings would then lead to a rather low return temperature of 40 °C. The solar system is part of a larger project to develop renewable heating in Tibet. Feasibility studies were conducted in more than 20 of the region’s counties and cities and Tibet’s local government has approved funding for five of them. The county of Langkazi has already completed its tender process, awarding the contract to Arcon-Sunmark Large-Scale Solar Systems. The joint venture is now in charge of the entire Renminbi (RNB) 122 million investment (USD 19.26 million), including the construction of the seasonal storage, collector field and district heating network.